Editor's note: Schools across Illinois are seeing great success with Google for Education. To highlight some of their achievements, we’re featuring Chicago Public Schools, Community Consolidated School District 59 and Waukegan Public Schools. To learn more about Google solutions for Education, join us for a webinar on January 28th at 3pm ET / 12pm PT. Whether teachers help evaluate technology solutions or introduce new tools, getting their buy-in can reduce the strain and resources required from IT. Community Consolidated School District 59 (CCSD 59) wanted to increase literacy, collaboration, critical thinking and creativity, but didn’t yet have the right solution in place. The district formed a technology committee of staff from every school to lead its “Innovative Learning Implementation Timeline” and decide how to use technology to amplify learning. When teachers are involved, they can make sure technology and policies are designed to make planning lessons, providing feedback and collaborating more powerful and effective for all learners. Technology adoption will spread like wildfire once they see how it benefits both students and staff. The educational technology team at Waukegan Public Schools took a similar approach. After the schools introduced Google Apps for Education and Chromebooks, “Lighthouse Lead Learners” were identified at each building to help with professional learning at the building and district levels. “Since the instructional technology staff can’t be at every school all the time, this group of teachers is instrumental to making sure teachers and students get the support they need,” says Mary Mlinar-Stephens, Director of Educational Technology Innovation at Waukegan Public Schools. Students are more excited to learn when they get to choose how they learn. When CCSD 59 introduced new devices, they gave students the opportunity to use Chromebooks and Android tablets, since each device has different strengths. “We saw the potential of creating a 2:1 program, where students could choose the tools they need, depending on the learning experience,” says Benjamin Grey, Assistant Superintendent for Innovative Learning and Communication at CCSD 59. Watch this video to see how CCSD 59 is using technology to amplify student’s ability to learn. Introducing new tools poses an opportunity for schools to look at organizational culture. Ask admins, board members and teachers what they think the district stands for, and use technology to address those cultural goals. With Google Apps for Education, Chicago Public Schools (case study) created a more collaborative environment across the organization. “By leveraging Google for Education tools, we created a culture of collaboration, open communication and transparency,” says Margaret Hahn, Director of Technology Change Management at Chicago Public Schools. Jennie Magiera, a Google Certified Innovator, formerly a CPS teacher and now the CIO of a neighboring Illinois district, embodies a spirit of sharing and collaboration. In her Education on Air keynote, she discusses tangible steps to empower students to help transform classroom culture. Jennie and many other CPS educators participate in trainings at peer schools and speak at conferences like Education on Air to share their expertise. Technology opens new doors for teachers to be innovative and cater lesson plans to different learning styles, but many teachers don’t know about all of the opportunities. 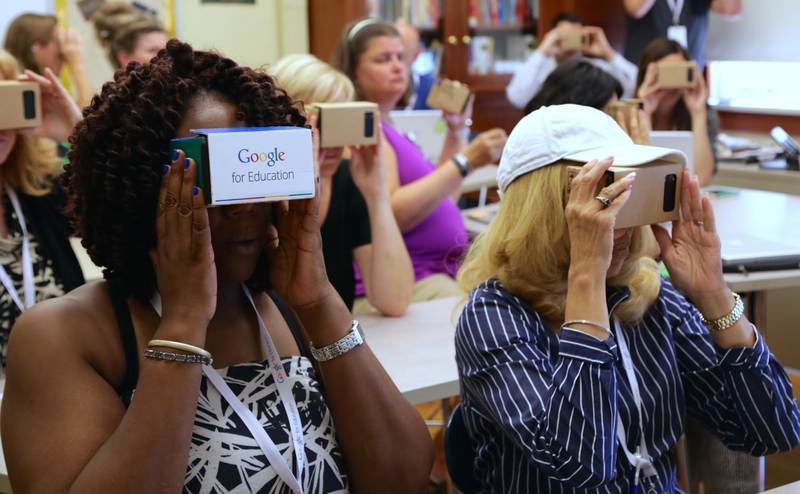 Chicago Public Schools organized and hosted a two-day professional development event, Googlepalooza, which featured more than 200 workshops for teachers to learn more about Google for Education tools. After the free summit, teachers introduced new tools to engage students and collaborate with peers outside the classroom. For example, a civics class used Hangouts to connect with a class in North Carolina and engage in a debate on the civil war. Another teacher incorporated Google Draw in her lesson plan to cater to students who prefer to express their ideas in artistic form. When teachers have the opportunity to learn and practice using new tools, they see even more ways to take their use of technology in the classroom to the next level.